Examples of licences. Please click below for your recovery scenario. Recovery of a single file. License 'on-demand', fee of 200€ and a recovery code to recover single file. Cost for recovery code starts at 50€ (see table below for pricing on recovery codes). Recovery of a few files on multiple filesystems on a single machine. License 'on-demand', fee of 200€ and a recovery code for each file to recover. Cost for each recovery code starts at 50€. Recovery of many files smaller then 10MB on multiple filesystems. No need for additional recovery codes, this license permit recovery of all files smaller then 10MB on all filesystems (smaller then license size on a single machine). Recovery of many files smaller then 10MB and a few large files, on multiple filesystems on a single machine. 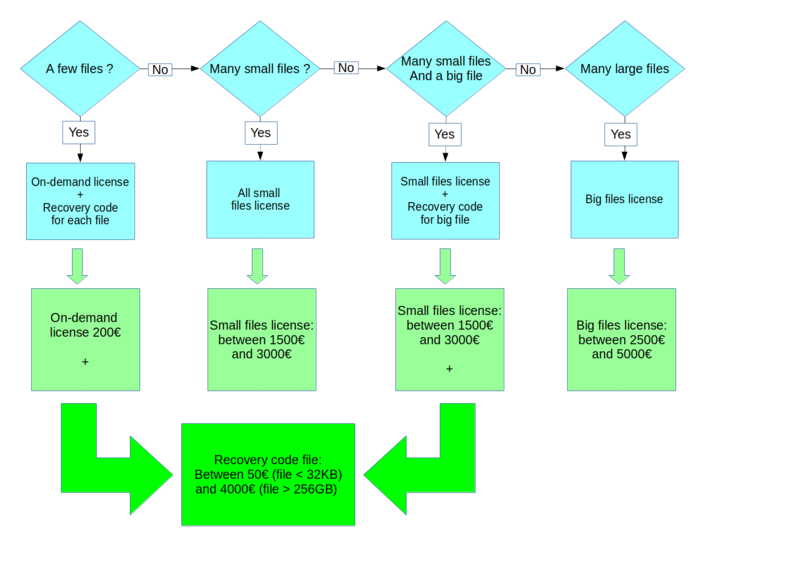 and a recovery code for each large file (see table below for pricing on recovery codes). Recovery of many files larger then 10MB, on multiple filesystems on a single machine. No need for additional recovery codes, this license permit recovery of all files on filesystems (smaller then license size on a single machine). Recovery of many files (larger and smaller then 10MB) on one or more filesystems smaller then 16GB, all on a single system. Class I license 'all files': 2500€. Recovery of many files smaller then 10MB on three different filesystems (sizes 80GB, 400GB and 2000GB), all on a single system. Class III license 'small files' : 2500€. Recovery of 1 file of 512MB. Recovery of many small files on a 19GB filesystem and 1 file of 100MB. Class I license 'small files': 1500€. It is also possible to combine a license 'small files' for recovery of all small files and purchase individual recovery codes for files larger then 10MB. All licenses are valid for three months, all prices quoted excluding taxes.